When comparing Shopify and Squarespace, you need to clearly understand either you want to build a website or a digital store. Do you need a good web representation or a platform letting you sell products online. In order to find out which site builder will work best for your business, first you need to define your current needs and whether you plan to grow your biz in the future, because despite the shared goal – to help you bring your business online – Shopify and Squarespace have different user markets, approaches and purposes. Shopify – is an eCommerce platform designed specifically for launching web shops. The solution comes as a professional tool to create a solid marketplace as well as manage your sales and products. Shopify boasts great integration capabilities. It offers a variety of apps and services to handle purchases, promotions, marketing, etc. Squarespace was initially created as an instrument to build content-oriented websites, not digital stores. When we say “websites”, we mean blogs, portfolios, business cards, etc. The system serves well to achieve those goals with a rich enough feature set. However, it looks not as professional in terms of eCommerce functionality that has been added relatively recently. To figure out, which one is the best suit for your selling needs, we are going to enable a in-depth Squarespace vs Shopify research to highlight some of the key factors and features brought to you by both platforms. Shopify. Shopify made an effort to combine eCommerce functionality with the ease of use. Although its interface might seem to be e bit more complicated that in content-based site builders, it will not more than a couple of hours to figure out how the system works. We should keep in mind that the system was initially created as the solution to create online stores. On the other hand, it still has a drag-and-drop feature to edit pages in addition to a simple content editor. Moreover, technical geeks and coders can access platform’s CSS or work with its custom Liquid coding language. It ensures better flexibility and customization opportunities. Shopify has a simple dashboard letting you work with the content. All you need is to choose the page you need to edit. The process is similar to working with MS Word or Google Docs. You will hardly find it difficult. Additional dashboard settings include instruments to add logos, change default colors and fonts, show or hide elements, etc. Users should not worry about the Shopify complexity. They will get a ready-to-use digital store structure instead of building each section step by step. All you need is to modify already existing sections or pieces while the core of your future shop is already working. Building with Shopify does not require coding or web design skills. You can choose from a collection of templates featuring automatically responsive design. It means the templates will run equally well on desktop and mobile versions. Users are not forced to handle the payment data themselves. The platform will take care of online payment system for you. 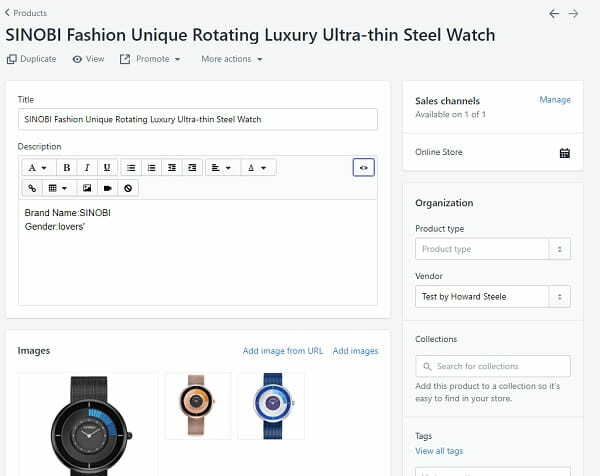 In addition, you will benefit from a built-in product catalogue module without the need to manage all items manually. It means that you can remove and re-order on-page sections and elements easily. O the other hand, some problems might appear when you try to drag-and-drop images. Just hovering the mouse to the interface screen is not enough. The only way to upload media content is to access platform’s Style Editor. It provides tools to customize different elements. Users can resize blocks, place them wherever you need as well as choose form ready-to-use page styles and structures. The editor has pre-built coverage for different page types including Landing Pages, Blogs, Galleries, Event or Index Pages, etc. Simply choose the type you need and add relevant content. Shopify vs Squarespace: both platforms are pretty easy to use though users may come across slight difficulties when using the interface. However, Shopify provides a wider array of custom editing solutions to build and manage an online store. Product Management – The systems makes it easy to add new products, manage item groups, etc. Users can benefit from ready-to-use product catalogue module. All you need is to add product images, description and prices. 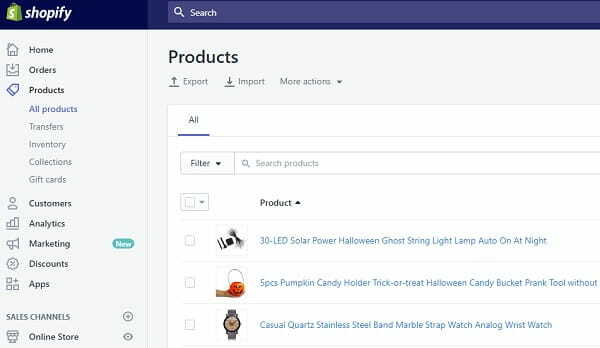 Moreover, you can create your own product categories. Automated EU VAT calculation will certainly be a huge plus to save time and meet VAT MOSS requirements. Shopify App Store – The platform has its own eCommerce marketplace with a range of add-ons and widgets for your future online store. The selection of apps includes solutions for analyzing, reporting, payment processing, loyalty programs, social media marketing, etc. Flexibility and Integrations – Apart from the app store, the system can integrate with a range of third-party services. A good solution for those who crave for extended website functionality thanks to Zoho, Zendesk, QuickBooks or other integration opportunities. External Trading – Shopify lets you generate revenues not only through the website. The company introduced its point of sale system for physically located stores. At the same time, it makes it easy to turn your Facebook page into an online trading platform without actually building a website. Advanced Reporting Features – You will keep an eye on all crucial sale stats and results. The system defines the most successful traffic and revenue channels. Shopify Augmented Reality – Shopify AR feature lets customers benefit from the realist and real-life product viewing experience. Enabled by the 3D Warehouse application, the AR-based technology delivers a true sense of item’s size, color, quality or other crucial characteristics. Each product is available as the 3D model. We should also mention promotion and reward features that can increase your customers’ loyalty. Basic Collection of Widgets – The lack of custom app store becomes obvious once you have started to building a website. The platform has only baseline apps that include galleries, social media buttons, contact forms, etc. Good news for cafes and restaurants – the platform has some eCommerce features for eating out venues. Analytics – You do not have to install analytic tools to track the website stats. Squarespace comes with an in-built Metrics App. Another option is to integrate Google Analytics. eCommerce Functionality – It might come in handy whenever you need to integrate a shopping cart or some of the available payment options in addition to an SSL certificate. 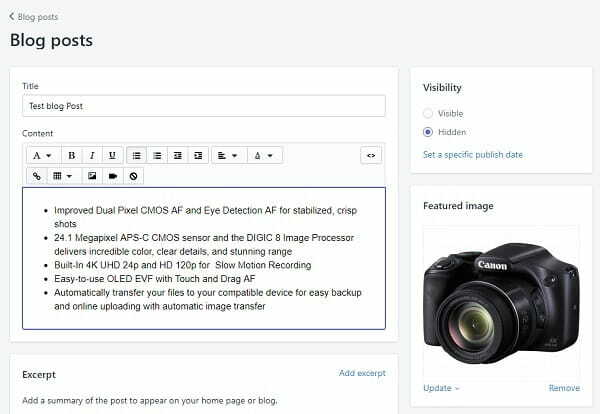 The functionality makes it possible to create clickable item images that will transfer users to a product page that may contain videos, prices, photos or any other vital information. The system lets users add up to 100 items. Payment Options – Those look very limited if compared to Shopify. The system uses only Stripe to process payments made through MasterCard or Visa. Squarespace offers some promotional opportunities in the face of promo codes, vouchers, discounts, etc. 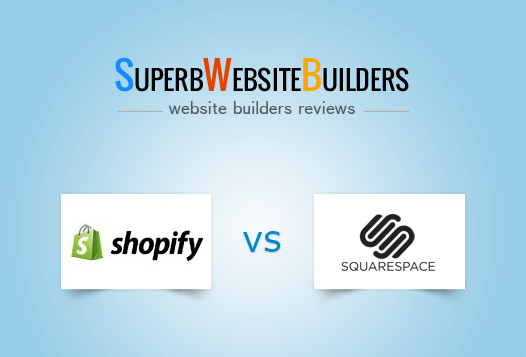 Shopify vs Squarespace: Shopify looks obviously like a better option for eCommerce projects. The feature rich platform is more flexible in terms of product management, payment options or integrations. Squarespace is still a content-based website builder with some slight selling options that are not enough for a major online shop with further extension. Shopify. Shopify lets you built professionally looking web shops using its free and paid templates. The selection of free themes is pretty limited. On the other hand, they still look rather pleasant and user-friendly. The collection includes about 10 free templates that might look not enough for demanding users. This is where CSS/HTML access may come in handy whenever you need to implement a unique website style. However, only technicians will handle the editing process. As for paid templates, the selection includes a bit more than 60 themes that look very professional and trendy. They are divided into categories to meet different types of stores regarding their sizes. By the way, all of them are mobile-friendly. The only problem is that you will have to add about $190 to your budget, which might be a fortune for a single template. Squarespace. Squarespace templates look gorgeous. They are professionally designed. The range of themes consists of 90+ options although most of them mainly refer to content-based sites such as portfolios and blogs. The system offers CSS and HTML editing opportunities through its Developer Platform. However, it is available only with the Premium Plan. System’s check out page editor might work well whenever you need to take customers to another template or product page. Cover Page Builder will also come in handy to create catchy landing pages with stunning images and other types of content. Users can choose from up to 29 ready-to-use cover page layouts available for customization. Shopify vs Squarespace: Squarespace boasts gorgeous design while Shopify selection of themes looks a bit limited. Paid templates are a bit pricy. However, CSS/HTML access can be a good solution to the problem. Shopify. Shopify has a diverse customer support available through several channels. To get started, you will be offered interactive tutorials and guides that highlight all key steps of building a website from scratch. Moreover, customers can create their own threads on Shopify forum and discuss the issue with other Shopify users. Squarespace. Squarespace is also a good platform in terms of customer support. It has a ticketing system to resolve issues via email. Tutorial Resources contain multiple materials including video guides, articles and blog posts that can be pretty useful. Additional ways to contact the support team include 24/7 Live Chat. Squarespace vs Shopify: both platforms hardly lack means to get in touch with the support team. Lite costing $9 per month. Basic Shopify costing $29 with all basic features to launch a new digital store. Shopify plan costing $79 per month with unlimited, professional reports, and other features to for growing projects. Advanced Shopify costing $299 per month with advanced features for scaling eCommerce projects. ✔ $100 Google AdWords Credit. Personal Plan for $12/mo (not good for eCommerce). Business Plan for $18/mo (good for tiny digital shops). Basic Online Store for $26/mo (good for starting eCommerce projects). Advanced Online Store for $40 (good for medium and larger digital stores). Shopify vs Squarespace: although Shopify plans a more expensive, they deliver more eCommerce features to build a solid webshop. Moreover, the plans are to meet different requirements, which makes them more flexible if compared to Squarespace plans. Choosing a platform for the eCommerce project is very important. You need to be 100% sure you get all necessary tools to handle the store management process delivering enhanced buying experience to your users. Generally, Squarespace is more a versatile site builder than an eCommerce platform, so if you have a Squarespace-built website and have a few T-shirts to sell online, then Squarespace Commerce will certainly handle it. But if you plan to create a feature-laden shop, you’ll need something more powerful, like Shopify. Shopify is a more eCommerce-oriented website builder with plenty of integration opportunities, its own app store, free and paid templates, great customization capabilities, etc. What’s more important, it delivers a comprehensive editor, great promotion and marketing tools to grow business in addition to analytics and reporting functionality. 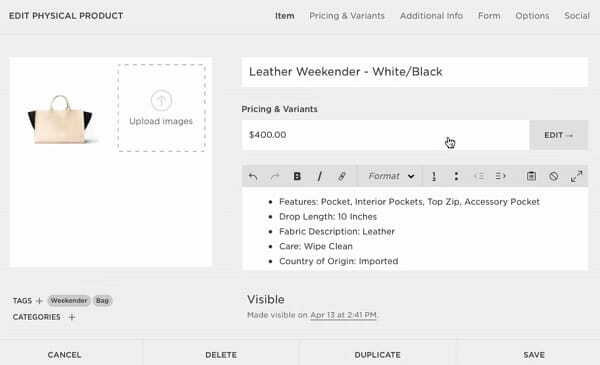 Squarespace is still a content-based website builder with only some extra eCommerce features that have been recently added. It offers instruments to build mainy small business websites. It can be also good to display products or services but not good for creating a solid online marketplace. Building digital stores is more about functionality and convenience for customers rather than stylish look. For this reason, you need to opt for platforms that are more business-oriented with enough tools to handle sales. From this point of view, Shopify looks like a better option.